there is an ongoing debate in some circles about fake vs. real christmas trees. well, those with fake trees often prefer that they are referred to as faux trees, but nonetheless they are fake. up until last year i always had a real tree. when i was a child, my dad would determine the evening that we would get the tree based on how cold it was outside. if the temperature was well below 30 degrees fahrenheit, he would say “dress warm, let’s go get the tree” and off we would go to the local elks or k of c tree sale. his strategy was that the tree sellers would be more likely to sell trees below the inflated, original price just so they could get the sale, and go back into the warming hut. at some point in my adulthood i developed price ceilings that were well below the going rate for decent sized trees. 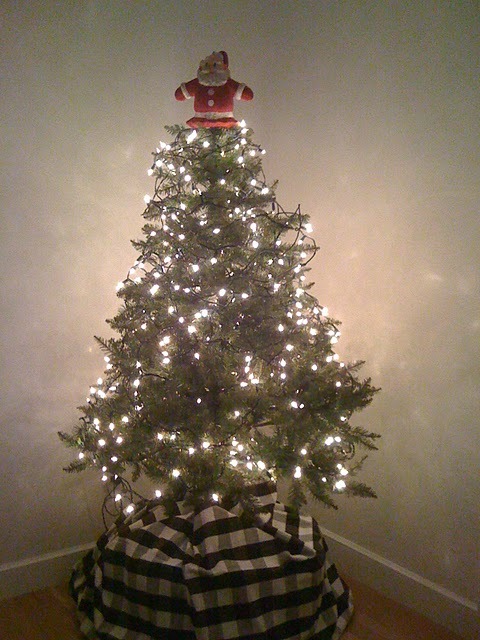 as a result i always had a charlie brown type of tree-downright scrawny, but it got the job done. it would fit in the trunk of my little compact car and more importantly fit through the door of my compact apartment. those were simple times. i miss them. last year my mother replaced her small, fake tree with an even smaller table top tree. she gave me the hand me down tree. i felt badly about converting from a real tree user to a fake tree user, but i have to honestly say that it is a joy. no needles, no mess, no watering, no dismantling lights- i just toss a sheet over it and swoosh.. put it away… it takes about 15 minutes to set up or take down. i was never big on the whole tree decoration thing… that seems to be completely overrated. kids like to do it, but you wind up with 40 ornaments jammed into about a 10 inch square near the bottom of the tree. adults usually have 3 glasses of wine and fight over the tangled mess of lights or allow the most energetic grown up to do the lights and then retire to the sofa for a nap. my preference is just a simple tree with tons of lights. that was how this tree started out, but my mother kindly allowed me to “borrow” her santa for the top of my tree as it was now too big for her new little tree. this little santa was on our family tree for as long as i can remember. he lights up, but i am too much of a chicken to plug him in for fear that the wiring would short out and well, you know how that story would end. he is very 1950’s. i think that my dad won him in a sales contest, but that might not be accurate as i attribute many sort of cool 50’s stuff in my parent’s home as one of dad’s winnings… by cool things i mean, the big yellow mixing bowl that my mother uses for big jobs like stuffing and cookie dough, or the ridiculously heavy, ironing board that my mother used up until last year when she found a lighter weight model… well, enough about that. i am very pleased with my little fake tree. i know that fake trees are arguably not environmentally friendly, but i didn’t buy it new and don’t plan to throw it away. it is recycled in round about way. i am not crazy about the plastic fumes that are probably offgassing in my house, but maybe that’s better than a pesticide laden live tree. in short, when i look at my fake tree with the sentimental santa at the top i have the same feeling that i had when i was a child, that christmas does have a tiny bit of magic to it.